Funds are tight everywhere these days, and one thing that must have gotten slashed from the budget of the Florida, NY Town Hall is mowing. Of course there’s not a lot of lawn to mow in front of the town hall, it’s just a tiny oval island of green in a sea of blacktop. Usually it’s scalped into a brutally short crew cut, but this year they’ve let it run wild. Which is to say, the grass must be quite two inches long. 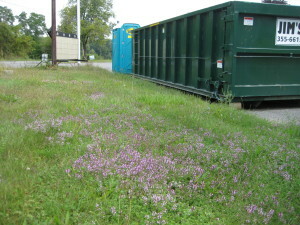 And intermixed with the grass are several large purple patches of thyme. Lying on my stomach on this sun-warmed savory blanket, I can see the honeybees bumbling around among the tiny purple flowers. I take the opportunity to watch as a honeybee sips nectar. They clearly deserve their reputation as hard workers—the bee hurries from flower to flower as though the boss were timing her with a stopwatch. She works her way up the half-dozen flowers on a stalk, grabbing a hasty sip of nectar from each one, going bottom-to-top, and then hastens off to the next stalk. She bustles through this one in the same way, bottom-to-top. Imagine doing a jigsaw puzzle. It’s hard, time-consuming, a little frustrating. Lots of tiny details and patterns to figure out, lots of small decisions to make. Once you’ve succeeded, if you then scrambled the pieces up and did the same puzzle all over again, it wouldn’t take as long. You’d be more efficient. And the third time you did the puzzle, you’d be better yet. Finding the nectar in a flower is a puzzle for a bee. The bee has to find its way through a maze of stamens, petals, pistils, and so forth, trying false pathways, learning to recognize patterns. It’s not easy to reach the nectar hidden within. 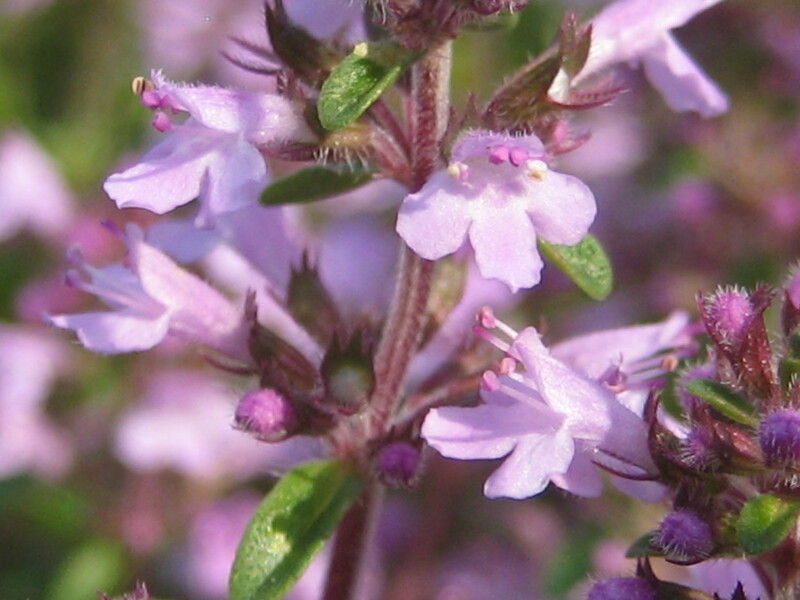 But on the second flower, the bee gets more efficient—if it’s a flower of the same species. 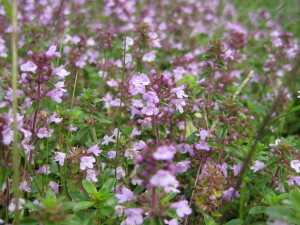 So the bee gets very efficient at getting thyme nectar, when it goes to thyme after thyme after thyme. When it flies to a daisy, that’s a whole different puzzle. So it’s better for bees–and many other species of nectar-feeders, from butterflies to hummingbirds–to have a lot of the same kind of flower. This behavior is called foraging constancy. 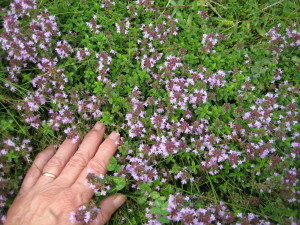 So this patch of thyme is a real time-saver for honeybees, who don’t have any time to spare right now. Bee populations are in trouble, and a lot of recent research points to pesticides as being a major cause. 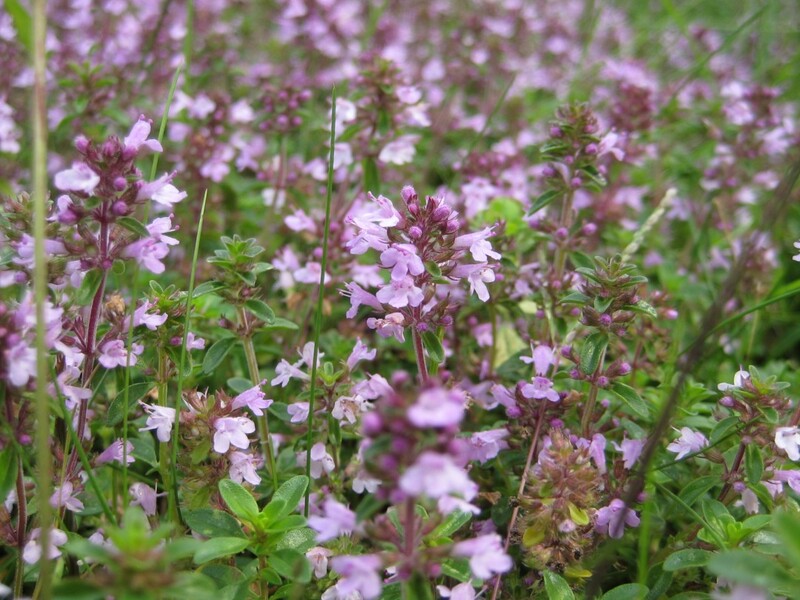 Fortunately, due to budget cuts, no one has gotten around to tending, mowing or spraying this patch of lawn, so it’s an organic thyme-nectar heaven for bees. 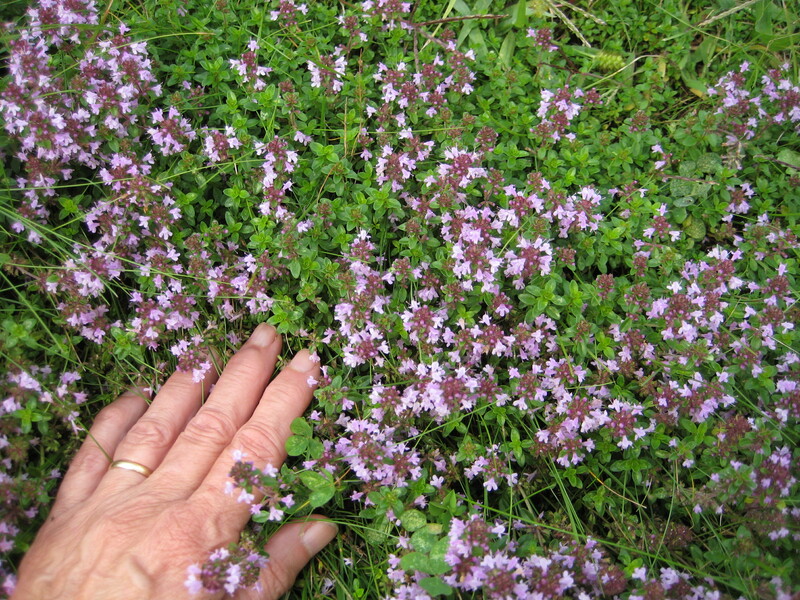 I love thyme and love the concept of foraging constancy – didn’t know there was such a thing! I am going to share this with the grandson – as always – but this time, connect it with patterns he is to look for in his 1st grade “wall words” at school (spelling words, back in my day! ).